A common Cajun dish is smothered 7 steaks. Cooked very simply with very browned onions, garlic, bell pepper, and generally served with hot cooked rice. The seven-bone or center chuck gets its name from its bone, which is shaped like the number seven. This steak lends itself well to braising. Many large supermarkets no longer offer the bone-in seven steaks; only the local slaughter houses offer these. Wipe the steaks dry and season the seven steaks with salt, black pepper, cayenne, garlic and onion powder or use any type Cajun seasoning combination. In a cast iron skillet, heat the oil over medium-high heat, add the steaks and brown the meat on both sides. Remove the meat from the pan after browning; add the sliced onions, bell pepper and garlic; sauté until the onions are soft and starting to caramelize. 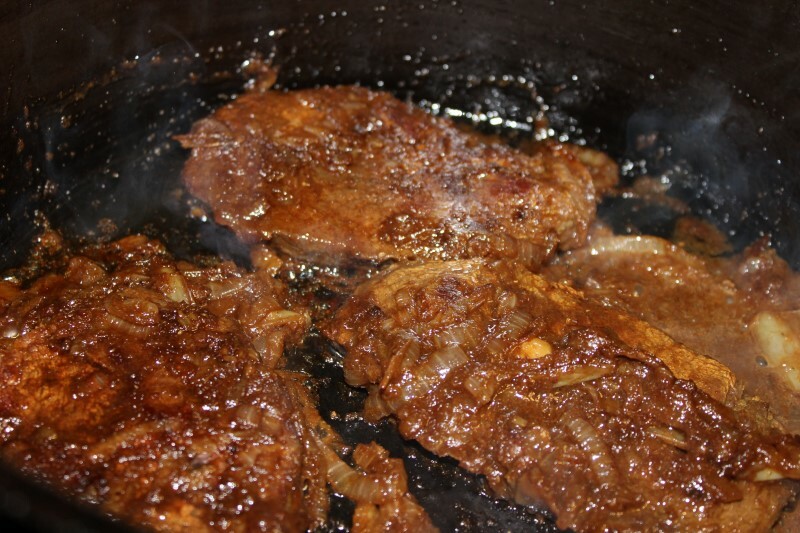 Return the steaks to the skillet and the add beef stock or water. There should be enough stock or water to cover the meat mixture. Stir to blend and then bring the mixture to a boil. Reduce the heat to simmer. Cover and cook approximately one hour or until fork tender. The water will reduce and the result will be a light brown oniony gravy. If the gravy is too thin; move the lid on the skillet and allow some steam to escape thereby reducing the thinness of the gravy. Serve the gravy and meat over rice or creamed potatoes with sweet petit pois peas and sliced cabbage slaw.